The right tools can make or break a sewing project. Like many of us, when I first started sewing I was using hand-me-down notions from my family and garage sales. I didn’t know what half of these doo-hickeys did and especially did not understand how to use them. One of the more terrifying items was something that looked like this. Was it a pizza cutter? It wasn’t until a few years later when I was working in a fabric store that I saw this bad boy in action. Commonly referred to as a transfer wheel, these magical items can help you avoid a whole lot frustration when transferring marks to your fabric. 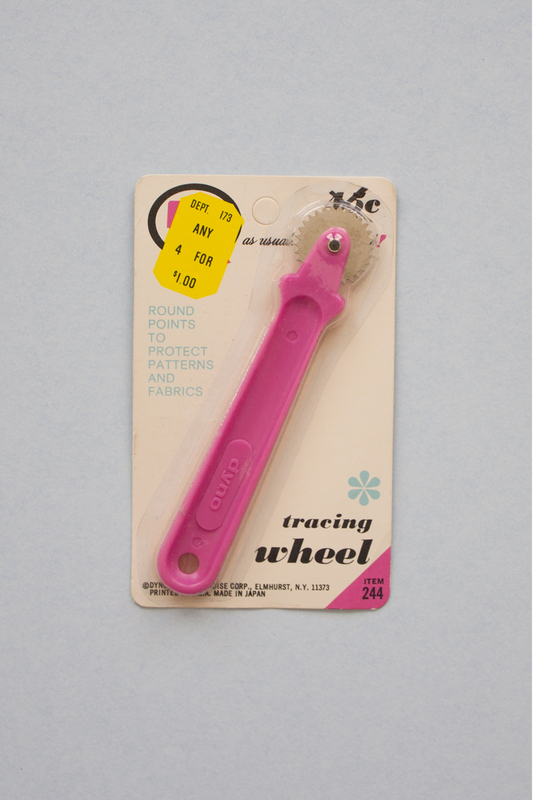 Simply put, a tracing wheel is a wheel that is attached to a handle. 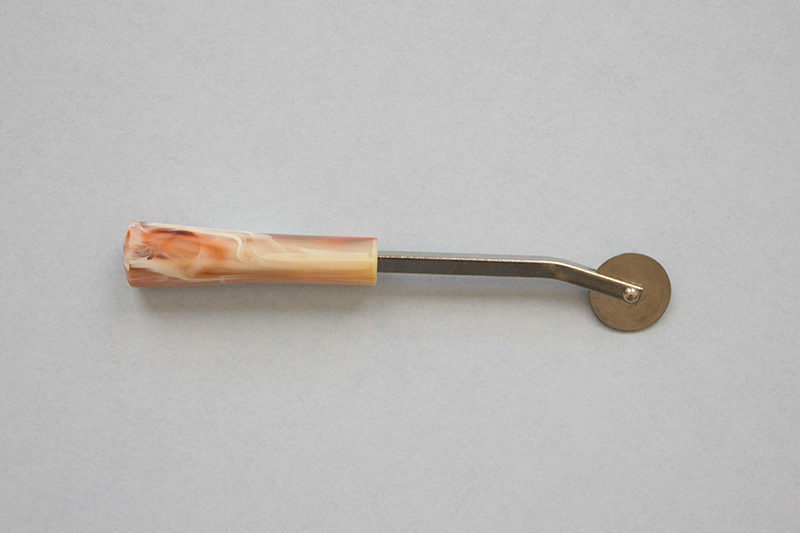 There are a few variations on this tool — the wheel can be serrated, pointy, and in some cases doubled! The serrated tracing wheel is the most commonly used tracing wheel. If you’ve ever bought one of those knick-knack-craft-bags at the thrift store, chances are you’ve got one. These wheels are used in conjunction with transfer paper. When pressure is applied to transfer paper it will mark whatever is underneath it, similarly to carbon paper. There are all kinds of different transfer papers and some work better than others. I recommend seeking out transfer paper that is wax-free, double-sided, and comes in a pack of different colors. The wax-free aspect will ensure that marks will eventually disappear either with washing or time, the double-sides are great for when you are marking two layers, and of course some marking colors will show up better than others on different types of fabrics. The shape on the edge of the wheel is either pointed or scalloped. The points will create little dots and the scallop makes a dashed line, that some would argue is easier to see. With a tracing wheel and tracing paper you can mark darts, button placement, or any other construction details from your pattern. Also, if you are searching out a way to avoid cutting your pattern paper, you can transfer your cutting lines right onto your fabric. This tracing wheel can be used in place of the serrated wheel but has an added feature. Depending on the fabric, a flat edge tracing wheel can be used similarly to a hera marker, to create creases in your fabric that act as construction marks. Fabrics that will lend themselves to crease-marking are bottom-weights and heavier wovens, due to their thickness and fiber memory. 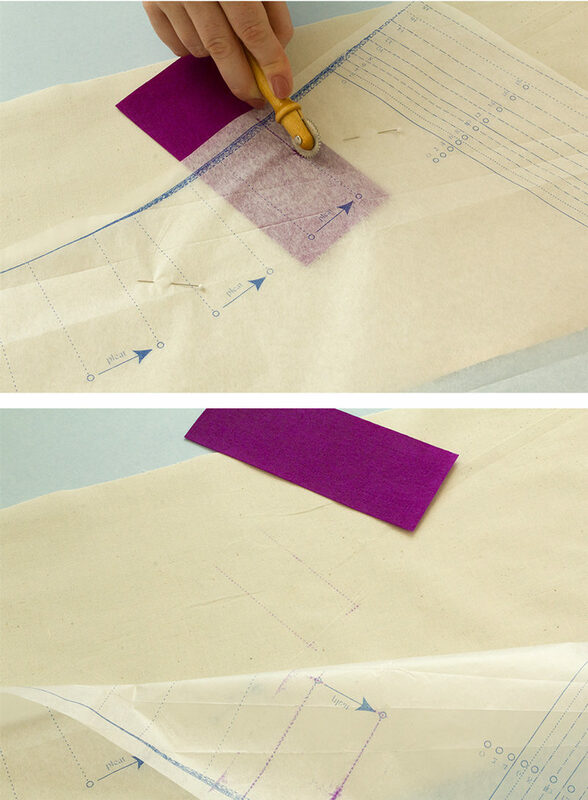 Try using a flat edge tracing wheel for marking hems, pleats, and tucks! Say you are tracing pattern pieces and would like to mark the seamline as well, this tool will save you loads of time! The double tracing wheel has adjustable width ranges that create parallel lines when tracing. 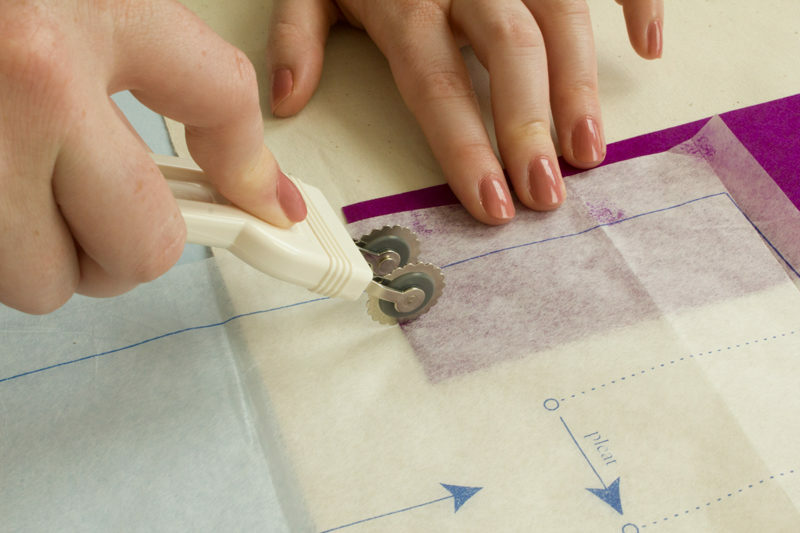 The double tracing wheel is perfect for muslins or adding seam allowances to patterns. Place the pattern piece on your fabric as usual. Use pins or pattern weights to keep the pattern in place. Choose a transfer paper color that will stand out on your fabric, for example, yellow is great for white fabric but not so good on green. Slide the carbon paper, under the pattern piece, against the side of the fabric you would like to mark. In the case of darts this will be the wrong side, but in the case of pleats this may be the right side of the fabric. Roll the tracing wheel along the mark you would like to transfer, with some pressure. Check your work! If your mark is nowhere to be seen, try again with a bit more pressure. If you are cutting on the fold and have two sides of fabric to mark, that’s when the double sided paper will come in handy. Simply slide the paper between the two fabrics and it’ll mark both sides, again keeping in mind whether your project is best marked on the wrong or right side. Hi! This looks great. I have several tracing wheels, inherited and otherwise (including one with a bone handle). They always look great when other people use them in tutorials, but every transfer paper I have tried has left no marks on the fabric or paper below it.. Do you have a brand that you recommend and suggestions about where to buy it? Thanks so much! We all have differing preferences in transfer paper. Do be honest, I’ve had the same package of Singer brand transfer paper that I bought at 7 years ago. For this post, we used disappearing Mark-Be-Gone tracing paper. It was a bit sticky due to the ink but it worked super well! Plus, it disappeared after a short amount of time. Hello Katie, thank for the introduction of this often forgotten hero of every sewers toolbox. I also have some inherited old ones, and they are still very well functioning. The double tracing wheel is a very good tool. That is the only wheel I had to buy on my own. It is not that sharp and your pattern paper stays in a good condition and with it it’s so very easy to add seam allowances in a consistent way at the same time while you are marking your stitching line. Tracing wheels are very important. I never cut a original pattern. Before I cut I copy the pattern for the next sewing projects. I never used mine until I ‘took’ Kenneth King’s “Jeanius” class. So many amazing things to be done with them. The smooth wheel is great for making temporary marks on a dark or thick fabric – the crease stays just long enough to transfer the mark from the tissue to the fabric, and then I can thread mark it. Nothing to wash out later. Thank you. This was very helpful. I did not know about scalloped. A new toy to try out! Where can I get the paper? All of the paper I’ve found is awful and you can’t see it on the fabric. I did not like using the wax transfer paper. I use carbon paper and it is less expensive. A Funny thing happened on my way to learning about tracing wheels. 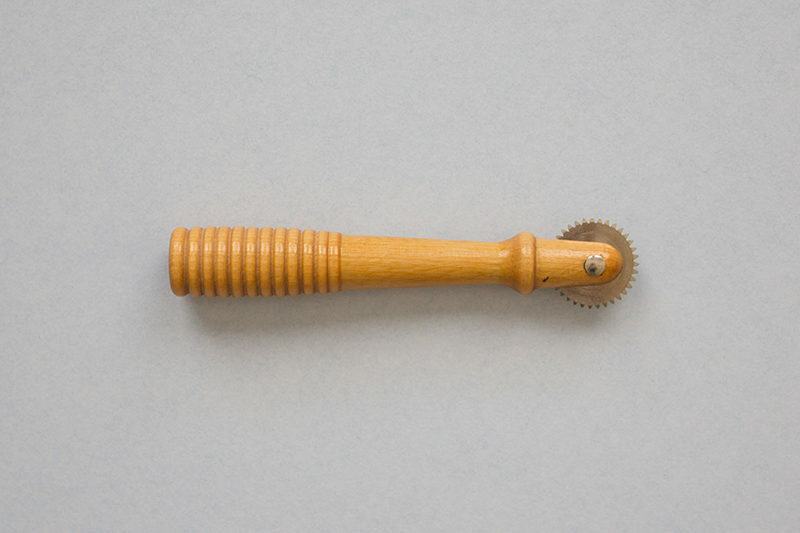 As a young girl I knew this was a tool of moms but found that this little spiked wheel-y made such great tracks on my dads wooden desktop! I don’t think I’ve used a tracing wheel since then. Maybe I can try again now, much more selective of my artistic materials! Thank you for instruction. Aha! I’d always wondered how people used these for thicker, bottom-weight fabrics. Thank you for enlightening me – I’m off to look for a flat-edged one now. I need one of those scalloped ones! I have only been able to find spiky tracing wheels, the one I have is too pointy and pokes right through both fabric and the transfer paper. And I’ve never seen one less sharp it a store. I have not been able to use mine to mark fabric but I often use it when I am copying patterns to make modifications. I found a scalloped one here! Totally! Here is a link for the Double Tracing Wheel and Scalloped Edge Wheel + Paper set. This was my introduction to sewing as a kid – my mom would cut out her patterns and let me roll over all the marks (can’t wait to have kids so I can treat them with the stuff I don’t want to do!!). Great article! I have never seen a double tracing wheel before. Using it to mark seam allowance is a great tip!